'My colleagues, Geraint and Luke, in A Fortunate Universe, take you on a tour of the Cosmos in all of its glory, and all of its mystery. You will see that humanity appears to be part of a remarkable set of circumstances involving a special time around a special planet, which orbits a special star, all within a specially constructed Universe. It is these sets of conditions that have allowed humans to ponder our place in space and time. I have no idea why we are here, but I do know the Universe is beautiful. 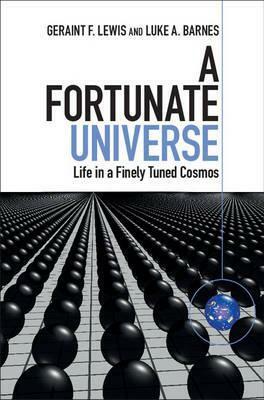 A Fortunate Universe captures the mysterious beauty of the Cosmos in a way that all can share.' Brian Schmidt, Australian National University, Canberra, and Nobel Laureate in Physics (2011), from the Foreword 'Geraint Lewis and Luke Barnes provide a breathtaking tour of contemporary physics from the subatomic to the cosmological scale. Everywhere they find the Universe to be fine-tuned for complex structure. If the quark masses, or the basic forces, or the cosmological constant had been much different, the Universe would have been a sterile wasteland. It seems that the only reactions are either to embrace a multiverse or a designer. The authors have constructed a powerful case for the specialness of our Universe.' Tim Maudlin, New York University 'The Universe could have been of such a nature that no life at all could exist. The anthropic question asks why the constants of nature that enter various physical laws are such as to permit life to come into being. This engaging book is a well-written and detailed explanation of all the many ways these physical constants affect the possibility of life, considering atomic, nuclear and particle physics, astrophysics and cosmology. It then discusses in an open-minded way the variety of explanations one might give for this strange fine-tuning, possible solutions ranging from pure chance, existence of multiverses, or theistic explanations. The book is the most comprehensive current discussion of this intriguing range of issues. Highly recommended.' George Ellis, University of Cape Town 'Lewis and Barnes' book is the most up-to-date, accurate, and comprehensive explication of the evidence that the Universe is fine-tuned for life. It is also among the two most philosophically sophisticated treatments, all the while being accessible to a non-academic audience. I strongly recommend this book.' Robin Collins, Messiah College, Pennsylvania '... charming, intelligent and exceedingly well-written ... a gentle stroll through the details of the Standard Model of particle physics, as well as the Standard Model of cosmology, but [the authors] lead us with such a light hand, a streak of humour and a lack of pedantry that the information is easily absorbed ... Lewis and Barnes show us how small changes lead to a variety of disasters. ('Ruining a universe is easy' Mr. Barnes quips) ... Is [our universe] a happy coincidence, as the authors ask each other in an amusing mock debate modeled on one Galileo wrote 400 years earlier, or is there some deeper reason? Where does science go from here? Does what has been popularly called a theory of everything exist? Is there a multiverse? Must we be satisfied with an anthropic principle? The authors discuss these questions and more in a final dialogue.' Gino Segre, The Wall Street Journal 'A Fortunate Universe: Life in a Finely Tuned Cosmos by Geraint Lewis and Luke Barnes, is a nice up to date book for the general (educated) public on modern physics and cosmology. If covers modern cosmology and some of the Big Questions of our times, in particular the issue of anthropomorphism how 'fine tuned' our Universe is.' Steinn Sigurdsson, ScienceBlogs (www.scienceblogs.com) '... what is truly unique about this book is that it presents the data at a popular level so that the material is accessible to anyone interested in this topic ... As I read the book, I was awestruck by the finely-tuned constants and conditions that had to be just right to get a universe that would permit life ... This evidence should move each one of us to ask, what is the best explanation of this incredible fine-tuning?' Tim Barnett, Stand to Reason (www.str.org) 'A Fortunate Universe is basically a book of physics, written by two scientists who are fascinated by the question 'Why are we here?' The language is straightforward, the style is easy, often witty, with short digestible paragraphs, and yet the subject-matter is inevitably dense and demanding ... It is pleasing to come across the line 'we do not know' so regularly in this book about the fundamentals of science, which echoes the book of Job ... When science reaches its limits, we have to consider a different kind of explanation for why the laws of nature are as they are, and why they are so finely tuned for the emergence of intelligent life. ... [The authors] wonder if classical arguments for the existence of God have anything to say about the fine-tuning of the universe, speculating whether God is a necessary being and whether our sense of truth and morality hint at God's inevitable existence.' Adam Ford, Church Times 'Reading this book is a great, not only intellectual, but also entertaining pleasure, the subject is difficult ... But the authors succeed in writing an inimitable way to write these questions with a light pen, as if they were opposed to them, and would be introduced, as it were, to the scientific questions about our world and our existence. It would be so easy to get into a mystifying murmur of this subject, into a quite sterile congestion ... The authors pursue a completely different task: they place scientific knowledge on the argumentative table, they do not lose themselves in the mysterious. Instead, they describe what is and what could be. They give their audience well-founded, solid scientific arguments, chat with him, and then leave his own thoughts. A highly readable, enriching, knowledgeable book ...' Matthias Bartelmann, translated from Sterne und Weltraum 'The title claims that the Universe is finely tuned for the existence of life. The authors provide evidence for this, investigate various possible explanations, and rebut the most common criticisms ... the book provides an opportunity to learn more at an accessible level ... The case is well made that the Universe is finely tuned for life; the interesting question is why. It could be coincidence ... Or could the Universe be no other way? ... Was it designed? Did it evolve? Or are there many universes in a Multiverse, and we shouldn't be surprised that we live in one which allows life? ... The arguments are clear; references are provided for those wishing to delve deeper; essentially all points of view are presented ... This is an important topic and the book is a good summary of the field. I enjoyed reading it and recommend it to those interested in the big Question.' Phillip Helbig, The Observatory 'It is the vivid, direct tone and writing style of a friendly physics lecture that perhaps most sets this text apart among popular-level science books about 'big questions' ... [The book] provides a big picture of the physics of fine-tuning, mostly accessible in lay terms, and gives aspiring philosophers of physics a taste of the tone and intellectual style one can find at cosmology conferences. Beyond that, it does so by showing the readers that a response from philosophers might be welcome. Because the authors make clear how their thinking is informed by works in metaphysics, philosophy of physics, epistemology, and the philosophy of religion, they tell the readers how they think philosophy does or could contribute, and where they think they do not know enough to see how it might.' Yann Benetreau-Dupin, Notre Dame Philosophical Reviews 'This book is for anyone who has ever wondered: 'Why is it so?' With colourful analogies and admirably accurate simplifications, Geraint and Luke have succeeded in making much of modern physics and cosmology comprehensible ... They address the biggest questions of science. What is dark energy? What is dark matter? Why is there something rather than nothing? Why is there more matter than antimatter? Where did the laws physics come from? Do we live in a multiverse? Do we live in a simulation? How different could the universe have been? If God is omnipotent, why does evil exist? ... Not even the popular scientist and writer Paul Davies tries to address so many important big questions in one book ... I enjoyed the book a lot, but I disagreed with the main thesis. No matter what your religious beliefs are, this book will make you think.' Charley Lineweaver, The Conversation (www.theconversation.com) "My colleagues, Geraint and Luke, in A Fortunate Universe, take you on a tour of the Cosmos in all of its glory, and all of its mystery. You will see that humanity appears to be part of a remarkable set of circumstances involving a special time around a special planet, which orbits a special star, all within a specially constructed Universe. It is these set of conditions that have allowed humans to ponder our place in space and time. I have no idea why we are here, but I do know the Universe is beautiful. A Fortunate Universe captures the mysterious beauty of the Cosmos in a way that all can share." Brian Schmidt, Australian National University, Canberra, and Nobel Laureate in Physics (2011), from the Foreword "Geraint Lewis and Luke Barnes provide a breathtaking tour of contemporary physics from the subatomic to the cosmological scale. Everywhere they find the Universe to be fine-tuned for complex structure. If the quark masses, or the basic forces, or the cosmological constant had been much different, the Universe would have been a sterile wasteland. It seems that the only reactions are either to embrace a multiverse or a designer. The authors have constructed a powerful case for the specialness of our Universe." Tim Maudlin, New York University "The Universe could have been of such a nature that no life at all could exist. The anthropic question asks why the constants of nature that enter various physical laws are such as to permit life to come into being. This engaging book is a well-written and detailed explanation of all the many ways these physical constants affect the possibility of life, considering atomic, nuclear and particle physics, astrophysics and cosmology. It then discusses in an open-minded way the variety of explanations one might give for this strange fine-tuning, possible solutions ranging from pure chance, existence of multiverses, or theistic explanations. The book is the most comprehensive current discussion of this intriguing range of issues. Highly recommended." George Ellis, University of Cape Town "Lewis and Barnes' book is the most up-to-date, accurate, and comprehensive explication of the evidence that the Universe is fine-tuned for life. It is also among the two most philosophically sophisticated treatments, all the while being accessible to a non-academic audience. I strongly recommend this book."